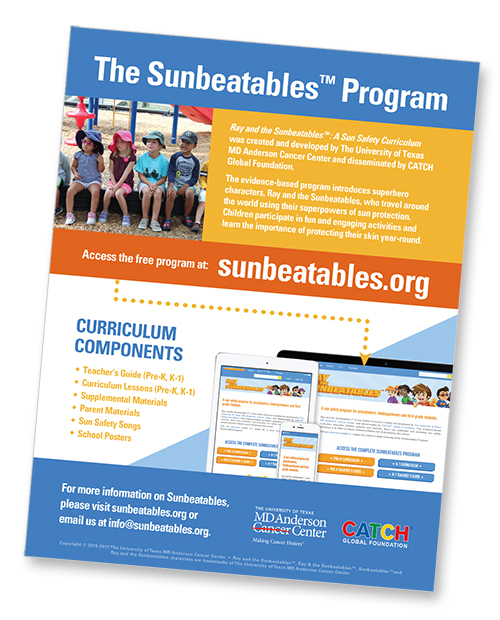 Ray and the Sunbeatables: A Sun Safety Curriculum created and developed by The University of Texas MD Anderson Cancer Center and disseminated by CATCH® Global Foundation. This evidence-based curriculum educates children, parents and teachers about sun protection and promotes sun safety behaviors in an effort to reduce children's lifetime risk of developing skin cancer. Click here to access the FREE Sunbeatables program.